The Roll of Honour commemorates the men and women of the district who served in World War One. 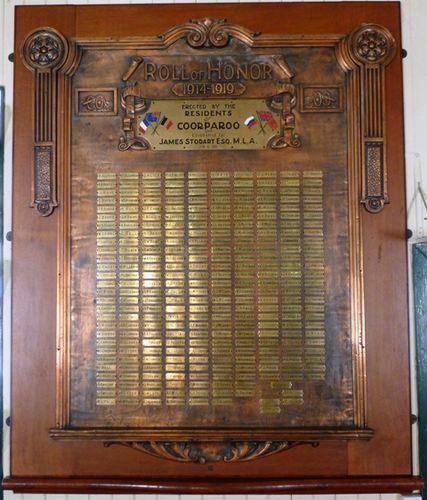 The unveiling of the Honour Roll by Mr James Stodart took place in the hall on 24th June 1916 . The cost of the roll was approximately £50 and had space for over 300 names with each name being on a brass plate affixed to the board. At the time of the unveiling, there were 150 names of volunteers on the roll. The Brisbane Courier, 20th June 1916. James Stodart Esq. M. L. A.